New Blood Entry — What Did David Bowie Do At Your Age? David Bowie is the symbol of creativity and bravery. He might have made some of the most influential music ever, but what's truly impressing is his willingness to experiment and try new things. 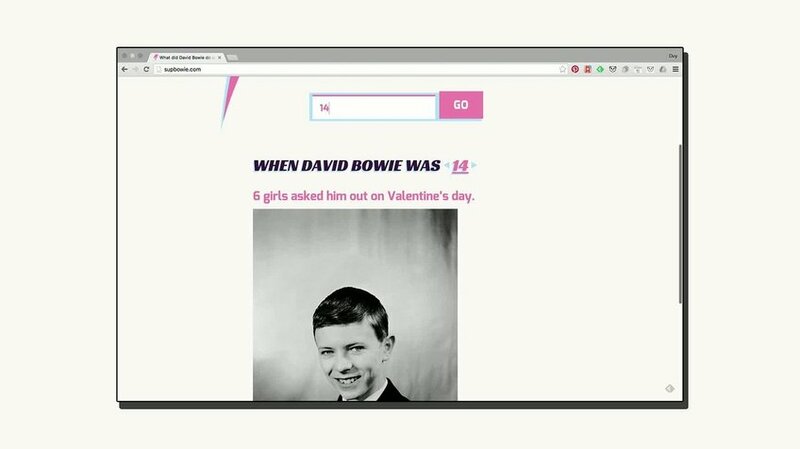 We created an interactive experience that lets you explore his life all the way from birth to death in a way that's very relatable to you, by comparing yourself to David Bowie. Enter Sup Bowie. A website that generated over a million views in 2 weeks. It was featured on websites like NME, Buzzfeed, Mashable and more. No money was spent on media. RIP David Bowie.